These are some CV injection points of the Poly-61. You need to connect the CV with an additional resistor. Try 100k.Decrease the value for a stronger effect and increase it for a weaker influence. These give you about the same range as the original controls. In case you are using the CV outtputs of the ModyPoly, connect a 100nF capacitor across the negative input and the output of the opamp to filter out high frequencies. This is not tested but I am pretty sure it is working. While the older brother of the Korg Poly-61, the Polysix, features a monophonic ‘Unison’ mode, the Poly-61 does not. The reason is most likely the fact, that the Poly-61 is DCO based, making the voice spread technology used in the Polysix Unison mode not possible. It is however nevertheless desirable to add a monophonic mode to the Poly-61. Playing a monophonic synth is quite a different experience compared to a polyphonic one and if you have extended features such as not retriggering the envelope when playing legato, a whole new world of sound opens up. If you install the Modysix mod you will have this feature build in, the only problem is: There is no ‘Unison’ button. You can select the unison mode using Midi, but it is actually quite simple to install an extra button and led. You only need four parts and a little bit of wire: A push button, an led, a diode and a resistor. The push button can be any kind of button, the one I chose is what I had lying around, but you can probably find one that looks more like the original buttons. The diode is a general purpose one, such as 1N4148. For the resistor choose a value of your liking. I found that the value of 470 Ohms used for the other leds in the Poly-61 gives too much brightness with modern leds (led technology has vastly improved in the last 30 years), so you might use a larger value such as 1k Ohms. 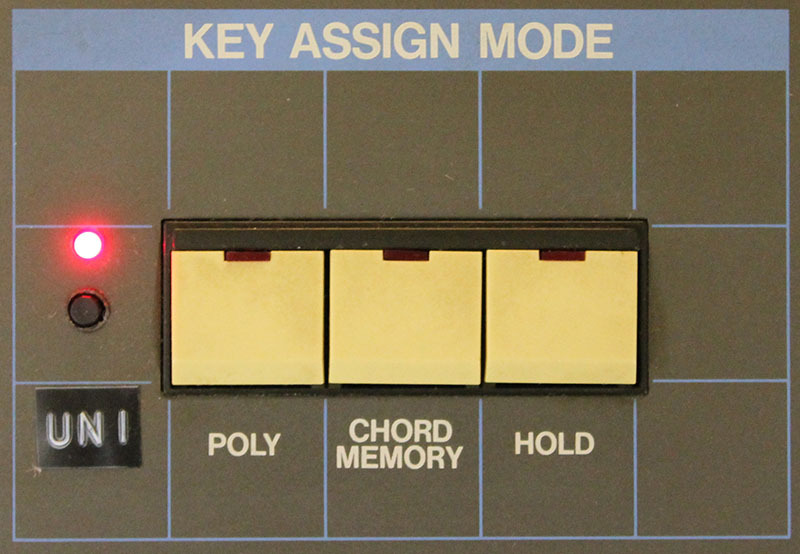 After installing the switch and led in the front panel, you can connect them to the panel board labelled KLM-482 – it is the one the ‘poly’,’chord’,.. buttons are mounted on. 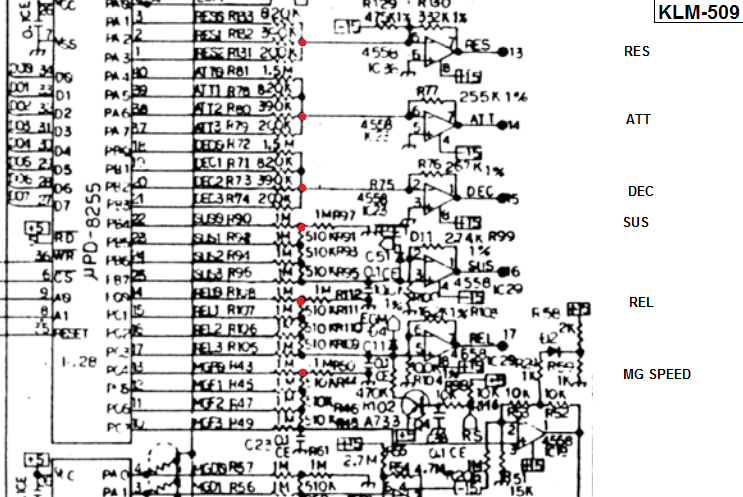 Pin3 and Pin9 in the schematic above refers to the pins on the connector on that panel. You can find +5V where I connected the resistor in the picture above. 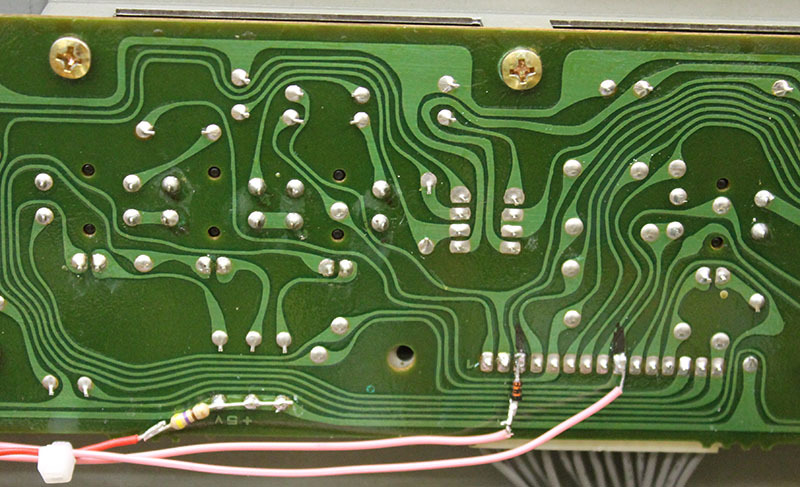 As you can see, I soldered the diode and resistor directly on the back of the PCB. 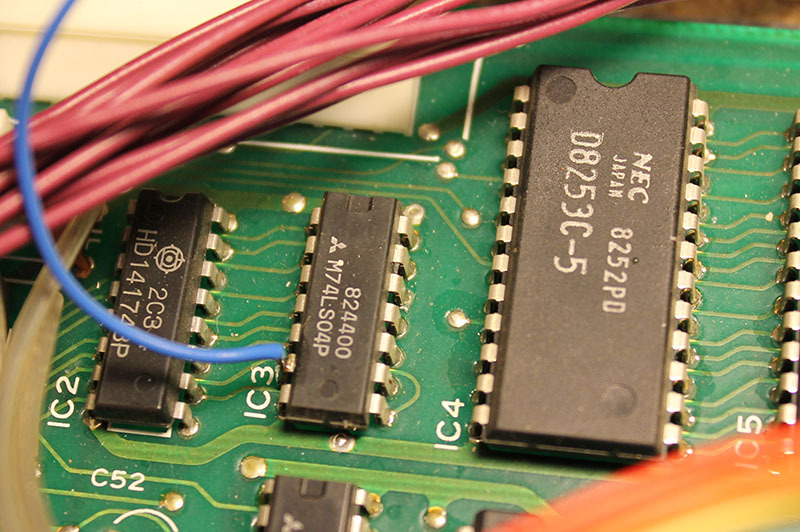 The last connection goes from the LED to Pin6 of IC3. It can be found on the processor board (the one with the battery). When finished you can now use the unison mode on your Poly-61. Have fun!